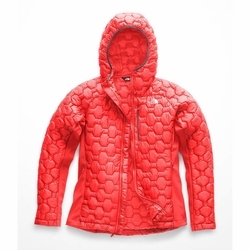 The North Face Impendor ThermoBall Hybrid Hoodie. Crush ascents this fall in The North Face's hybrid jacket featuring stretch-woven panels for excellent range of motion. Combined with the bottleneck quilting pattern with lightweight ThermoBall insulation that provides a superior warmth-to-weight ratio and fewer cold spots, you'll be ticking off your climbing goals like there's no tomorrow.